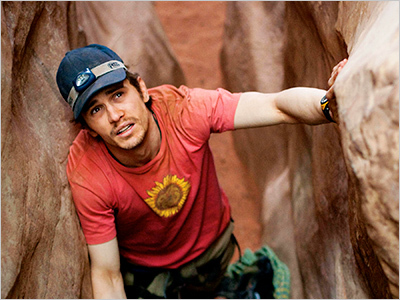 After helming 28 Days Later (and winning an Oscar for Slumdog Millionaire), Danny Boyle returns to a numerical movie title in 127 Hours, the true story of climber Aron Ralston. Anyone who goes into this movie knows the story of Ralston who went canyon climbing in Utah and accidentally fell in a chasm, getting his right arm pinned beneath a boulder. The story of sheer survival is highlighted by the fact that Ralston had to amputate his own arm to free himself from his predicament. All of these facts are known in advance but that doesn't take away from the brilliance of Boyle's direction and the career performance of James Franco. Amber Tamblyn and Kate Mara play supporting roles as hikers who befriend Ralston (Franco) before his climbing mishap. They are merely bit players in the James Franco show however. For most of the movie Franco is stationary in the chasm and we slowly witness the toll that the 127 hours of survival take on his character. Boyle does a good job of transitioning to Ralston's memories and various personal reflections on his life so we as an audience don't totally feel trapped in one spot. One signature elements of Boyle's direction is highlighted in the way Boyle focuses on Ralston's water bottle. As we see Franco waiver physically and emotionally we become more and more concerned with how much water is left in his water bottle. Boyle does an amazing job of putting a camera in the bottle so we can see exactly how much water is being consumed. Another directorial trick comes towards the end of the movie during the arm-cutting sequence. When Ralston tries to cut through a nerve (yes it's as nasty as it sounds), Boyle plays a lone quick guitar strum to emphasize the nerve being hit. Through these cinematic visual and audio effects, Boyle completely brings the audience into the chasm with Ralston and we're all along for the thrilling and terrifying ride. The middle portion of the movie does feature a few dull spots and I actually found myself fighting the urge to doze off a bit (I attribute this to the 10:15 start time of the movie I saw and the red wine I drank before hand). I managed to stay awake for 98% of the film though and I must say that I now view James Franco in a much different light as an actor. He's gone from mediocre stints as the Green Goblin to one of the best young actors working today (great performances in The Pineapple Express and Milk). 127 Hours is his Cast Away and he should definitely be nominated for Best Actor. He joins Jessie Eisenberg (The Social Network) as the front runner for the award in my mind. 4.5 our of 5 JRs for one of the best movies of the year. We should see Boyle being nominated once again for another gem in a stellar resume.